I can’t believe our blankets are almost done! Though I admit I am VERY behind on my squares. I’m actually gearing up for yet another trip to the country and hope to catch up blocks while I am there. The next few block videos may not be released with the Tuesday Schedule I’ve been using. I’m going to try to get them recorded before I leave and then post them as possible while I’m gone. I’m going away for some variety of Monday-following week Tuesday, or Tuesday to Tuesday or Tuesday to Wednesday, or…. It’s still fairly undecided, BUT I know my travel schedule will effect upload schedule. I’ll always try to upload early instead of late. When I get back I will hopefully have a whole heap of squares and will do a video about how to hook them all together. 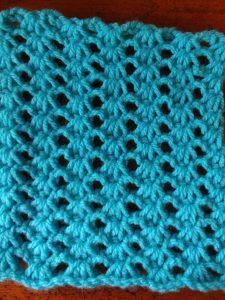 I do LOVE this lace stitch, but I won’t be using it in my blanket. I explain why in the video. I am already working on a scarf with it and will release some numbers (a very basic pattern) soon if you’d like to make a scarf with it as well. The rest of the CAL (and more video tutorials) can be found here. Here is my finished block for you to see. I also created a video about how to change colors, so if you need help with that you can find it here. 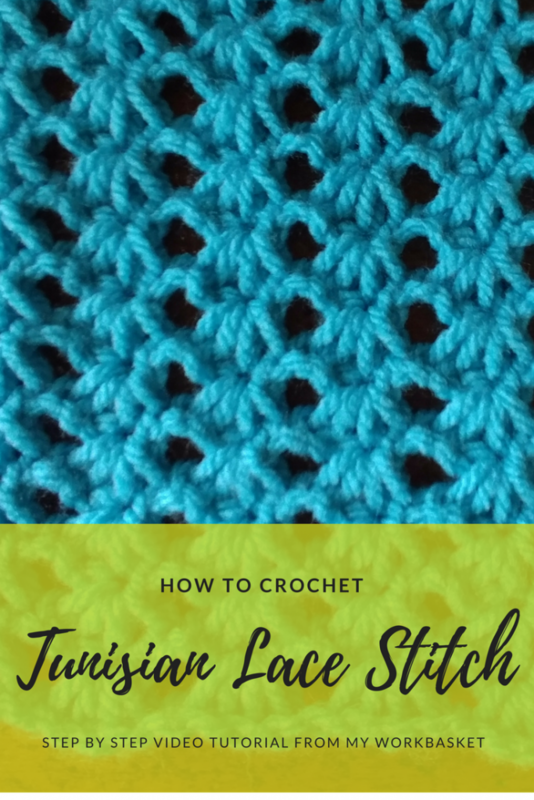 If you love the crochet hook set I use in all my videos there is a link on the green right sidebar (click the white arrows to expand the menu if needed) to the website to buy your own! You can also Click here to see the crochet collection. I also have the Denise knitting needle set and love them also! I hope you enjoy this stitch! I’d love to see your finished projects. I’m so far behind! I just started the purl stitch and missed the bias stitch so I have to go back to that one. I am finding the purl blocks don’t work up as quickly as some of the prior blocks, but that could just be practice. I am making my 2nd block. I can’t wait to look at the changing color video and trying out the hygge hat! It does work up much slower. Don’t feel bad, I’ve VERY behind on my blocks as well. I think I have about a dozen to make! Love the pattern. Wonder where I could get the pattern from please?